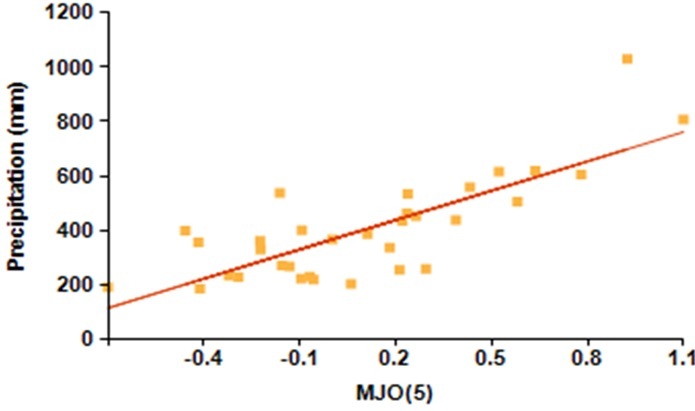 Linear regression between rainfall and values of the Madden-Julian Oscillation for Condega, Nicaragua, using ICI-RAFT. Source: Jason Giovannettone. These questions and others related to the statistical properties of rainfall can be answered using a technique called Regional Frequency Analysis, using a statistical method called L-moments. Using L-moments, all data from all sites within a particular region, regardless of missing data and varying record length, can be combined to make estimates of rainfall intensity and frequency at a specific location within that region. 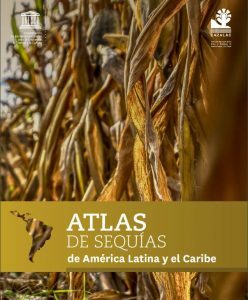 The most important product resulting from this initiative is the Latin American Drought Atlas. This was begun in 2008 as a collaboration between UNESCO’s G-WADI program, the Water Center for Arid and Semi-Arid Zones in Latin America and the Caribbean (CAZALAC) and ICIWaRM. It later received strong support from the Flanders UNESCO Science Trust Fund (FUST). These first efforts resulted in a set of manuals, regional workshops and the first published case study in the region, the Chilean Drought Atlas. CAZALAC continued to work to develop a generally applicable, consolidated methodology from 2010-2014 with funding from the EUROCLIMA and RALCEA projects of the European Commission, and ICIWaRM collaborated on one of the regional workshops given by CAZALAC. This collaborative work eventually led to the creation of the Atlas for almost all of Latin America and the Caribbean countries. A hard copy of the report was released by UNESCO and CAZALAC in October 2018 and is available here. The maximum expected rainfall amount associated to a certain return period. These maps have been integrated into a Regional Maproom with support from the International Research Institute for Climate and Society (IRI) to explore the exposure to drought interactively. Several software programs were developed through this work. These included REFRAN-CV, a version in the scripting language R, and a user-friendly interface based on the R-scripts, developed by CAZALAC and the Joint Research Centre of the European Union, and ICI-RAFT, developed by ICIWaRM to analyze various climate indices that help to identify modes of climate variability that affect a particular region of interest. A workshop to begin to extend the methodology to Sub-Saharan Africa took place in Paris-UNESCO in October 2018.